In the last benchmark of the suite, Doom 3, the ASRock 939SLI32-eSATA2 finishes things off quite nicely with framerates as high as the nForce4 SLI competition. 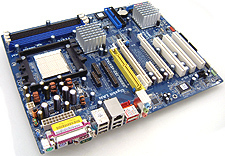 ASRock has an appealing solution here because it offers users computer hardware that has the potential to outlive its original processor generation. The Future CPU slot makes it possible for the ASRock 939SLI32-eSATA2 motherboard to support socket AM2 via a daughter card, when AMD's DDR-2 Athlon64 processor is introduced later this year. The only question we're left wondering about is just how available will these Future CPU sockets be? With a retail price of $111 CDN ($95 USD/£54 GBP), the ASRock 939SLI32-eSATA2 offers value seekers a lot of bang for the buck. The performance of the motherboard is quite good, it support SLI, dishes out eSATA options, and supports just about everything you need to make a well featured computer. It may not be the easiest motherboard to install, but it isn't so complicated either. Despite costing less than half of some of the other motherboards we've tested recently, the ASRock motherboard had no problems keeping up with the likes of the MSI K8N Diamond Plus or DFI LANPartyUT NF4 SLI-DR Expert. Both of those boards are among the fastest Athlon64 motherboards on the market this year. If you're in the market for a budget motherboard that has future upgradability in mind, the ASRock 939SLI32-eSATA2 offers a very unique SLI-compatible solution to this recurring dilemma.